1. 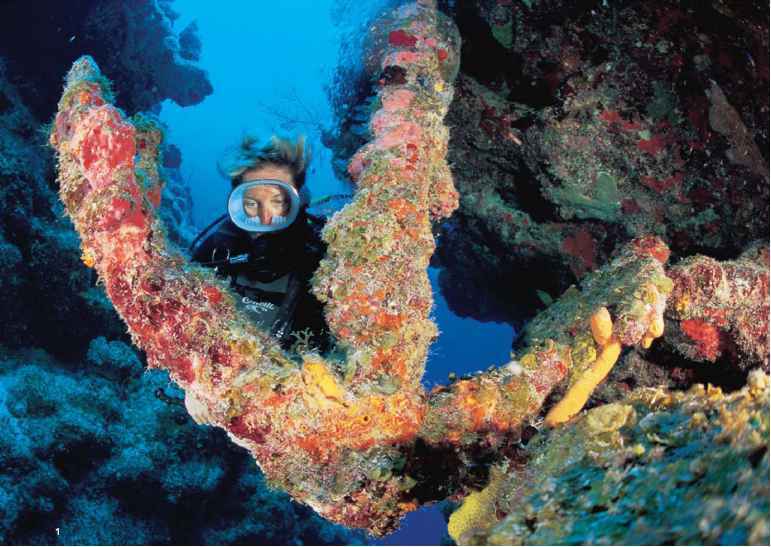 The famous, encrusted Spanish Anchor. 2. Barrel and rope sponges on a wall dive. 3. Secluded beaches aren't hard to find in the Caicos. 4. A tiger grouper awaits his cleaning. Easily one of the best-kept secrets in diving is the fact that the third-largest coral-reef system in the world lies just 75 minutes by air from Miami. That, plus 230 miles of pristine, white-sand beaches — and a permanent population that is well south of 25,000 — makes "T&C" perfect for travelers who want to see the Caribbean as it once was: wild and unspoiled. Yet you can still enjoy a world-class resort experience here. 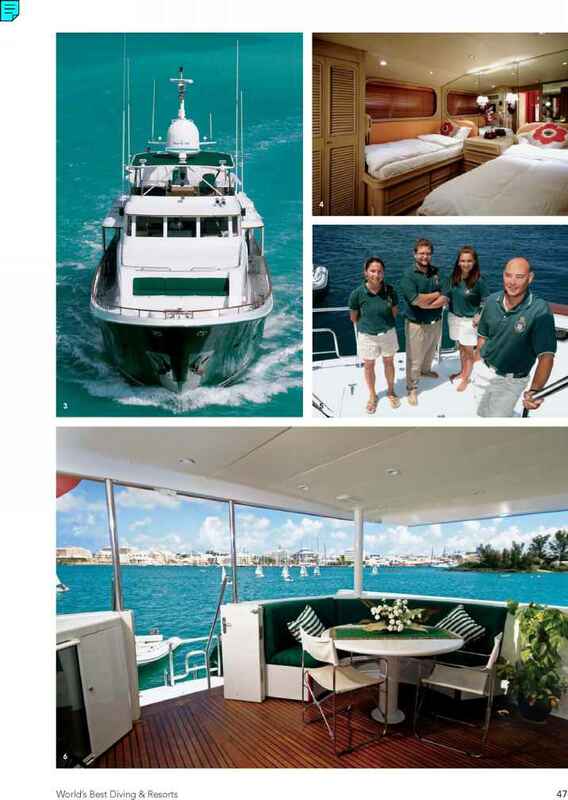 The island of Providenciales ("Provo" in diver-speak) offers resort hotels, a casino, golf, boutique shopping and more. Yet many of this nation's islands are completely uninhabited; visiting them by live-aboard dive boat is truly like a trip back in time. AVERAGE WATER TEMP: 80°F WHAT TO WEAR: Dive skin in summer; 3 mm fullsuit in winter. AVERAGE VIZ: 100+ feet WHEN TO GO: Year-round. WHAT TO EXPECT: Wall dives, friendly dolphins, sharks and other pelagics, stingrays over sand shallows, dive sites that have seen very little diver pressure, and shore-diving everywhere you look. LANGUAGE: English. TAXES: 10 percent room tax, service fee is usually added to bill. ELECTRICITY: 120 V, 60 cycles; U.S. appliances work here, but bring an adaptor if you need three-prong. TIME ZONE: Eastern Time; Daylight Savings Time April-October. and then drop away into midnight-blue infinity. And the north side of the island is home to a variety of creatures, including JoJo, a wild dolphin who has been playing with Provo dive visitors for decades. Grand Turk, West Caicos and Salt Cay also call out to wall-diving aficionados. At South Caicos, the wall drops away more than a mile, and large pelagic fish and sharks are a common sight. 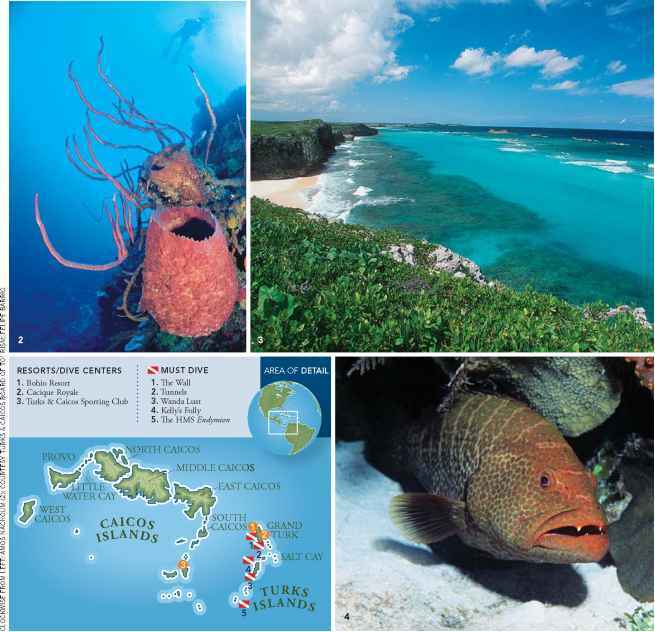 North Caicos sees far fewer divers than the other inhabited islands, and fish populations are dense and extremely healthy. Dramatically beautiful, near-effortless diving and a topside scene so tranquil that the term "laid-back" might have been invented here: if that's your idea of the perfect dive vacation, the Turks and Caicos are a secret you'll want to share.